Republican Speaker of the NC House, slickster Thom Tillis, had barely gotten his announcement for U.S. Senate out before he was being savaged by Tea Partiers, whose rage appears to have been building up for dangerous weeks. Dr. Greg Brannon, a Tea Party fringe character, an OB/GYN doc in Cary and until Tillis announced the only declared Republican candidate to challenge incumbent Democrat Kay Hagen, said that Tillis was the "poster child for why I'm in this race," and we're pretty sure that by "poster child," he didn't mean anything good. Brannon went on: "If Republicans in this state would rather be represented by a political insider, heavily influenced by special interests, who has taken liberal positions on legislation in the North Carolina State House, including ferry tolls, interstate toll HOT Lanes and the protection of telecommunication monopolies at the expense of smaller free market competitors, then Mr. Tillis has certainly proven he is willing to compromise on our core conservative principles to benefit his friends." Ouch. Only real problem is that Dr. Brannon is not considered a serious contender. Tea Party blogger Brant Clifton piled on. 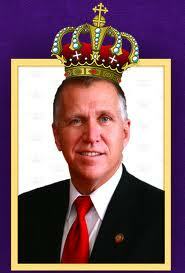 They surely do hate Thom Tillis.